The river island of Majuli is a part of the vast dynamic river system of Brahmaputra basin with a total length of 2,706 km and a catchment area of 580,000 sq km. 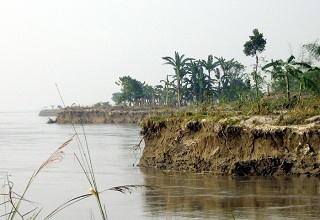 The fluvial landform (a riverine delta) of Majuli Island is a unique geographical occurrence as a result of the dynamics of the vast river system. The island extends for a length of about 80 km, 10-15 km north-south direction with a total area of about 875 sq km and at an elevation of 85-90 m above the mean sea level. It is formed in a stretch of the river where the largest number of tributaries drains out to form their delta on the northern and the southern banks.The north and south banks of the river Brahmaputra have wetlands- a characteristic feature of the hydrology of the system. They are locally known as Beels and are the breeding grounds of rich flora and fauna unique to this region. 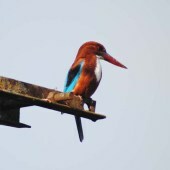 All of the above - the river, its tributaries, the wetlands and the chaporis along with the island of Majuli make it the largest mid river delta system in the world. 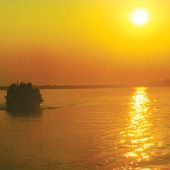 The island today is separated from the mainland Assam by 2.5 km can be approached from Nimati Ghat in Jorhat district to the south of the island by ferry reaching Kamalabari in Majuli. The other mainland towns in proximity to the island on the north bank are north Lakhimpur and Dhakuwakhana. 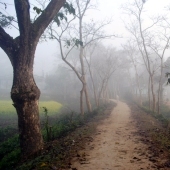 The island of Majuli today houses a total of 243 small and large villages. Of these 210 are cadastral villages (revenues generated by the administration and supported with revenue maps) and 33 are non-cadastral villages (villages without revenue maps are mostly resettled or rehabilitated shifted due to flood and erosion in Majuli). At the beginning of the 7th century, Majuli was a part of a large area. It was simply a landform formed out of continuous depositions of sand due to the changing course of rivers viz. the Brahmaputra (formerly known as Lohit or Luhit or Luit) flowing to the north of Majuli and one of its tributaries- the Dihing, flowing south of Majuli which received the Dikhow, Jhanji, Bhogdoi, Dhansiri rivers and some other small tributaries to meet the Brahmaputra at Lakhu. 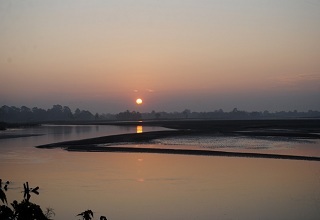 Physiographically, Majuli had an undulating land form. It had a network of large and small Chaporis or islets formed through different water channels, bound by rivers Lohit and Dihing. Diverse forms of natural resources i.e. 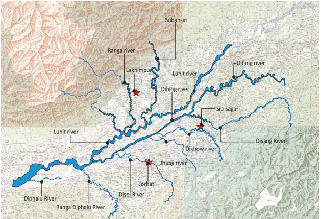 rivers at the southern and northern side, network of tributaries, and the Chaporis (small Islands) together developed a mid river delta system. 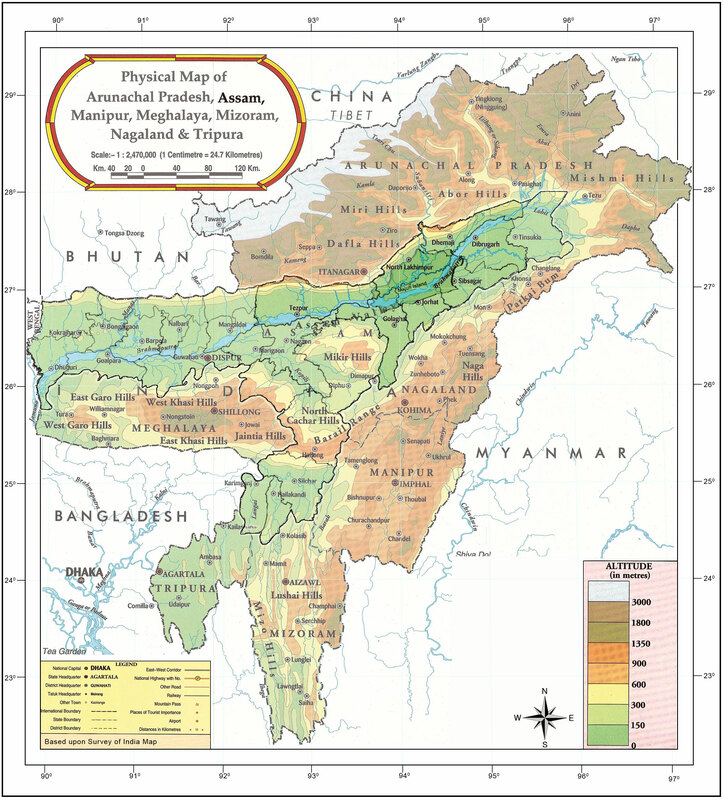 The river Brahmaputra and its tributaries were shifting southward, eastward and westward as part of the change of course in the river. Heavy rain fall and the melting of snow in the Himalayas resulted in the siltation of the river bed and as the process continued, it led to flood in the main land. It also led to the formation of many shallow, permanent/and temporary water bodies. As the main course of river Brahmaputra (Lohit) was much wider than the course of river Dihang, the north western part of Majuli was majorly affected by annual flooding. This resulted in the constant deposition of sand and the introduction of new plant species on the land. The hydrological system of the area was maintained by a network of tributaries; annual flooding and change of river course. It made the land fertile and created appropriate conditions for the formation of marshy land in large parts of the main land. They played a significant role in the overall eco-system of the area. Because of its peculiar location amidst the active floodplains of the Brahmaputra, Majuli gets inundated not only in severe floods but also in normal floods. The summer-monsoon season is the main flooding season for Majuli due to a number of reasons. 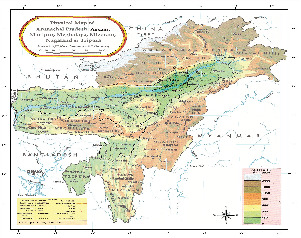 Throughout north-east India the average rainfall is very high varying between 100 cm to 1300 cm; it coincides with the period of snow melt in the glaciers of the Himalayas, origin of the Brahmaputra River. The Brahmaputra plains are surrounded by hills and mountains and thus the excessive run off from the catchment areas flood the limited area of the plains. Adding to this is the low grade of the Brahmaputra valley slowing the flow of water. The hills and mountains of the region are made of relatively soft rocks, easily eroded and deposited in downstream river resulting in siltation and braiding of the channel. Further, the great Assam earthquake of 1950 raised the bed of Brahmaputra increasing the frequency and intensity of the annual floods. Erosion has been a natural phenomenon on every river bank, especially since the soil is sandy and the geological conditions are evolutionary. Erosion on the southern side of the island has increased since 1950 constantly reducing the area of the land, eroding many villages and Sattras. This has greatly affected the demographic pattern, ecology, environment, social structure and economic growth on the Island. Disclaimer | Hosted by National Informatics Centre.